Need a job? You might be able to get some free Nacho Fries out of it—or put another way, if you need some Nacho Fries, they could potentially come with a piping-hot side of bright yellow, slightly gelatinous employment. Today, Moneyish published a story about the latest tactic at least two fast food chains are using to draw in new employees. As enacted by Taco Bell and Shake Shack, “hiring parties” involve free food and drink, branded swag, maybe the occasional game, and on-the-spot interviews. They are the not-a-regular-mom of job fairs. And, anecdotally at least, they seem to be getting (ahem) the job done, despite the unemployment rate sitting at 3.7 percent. 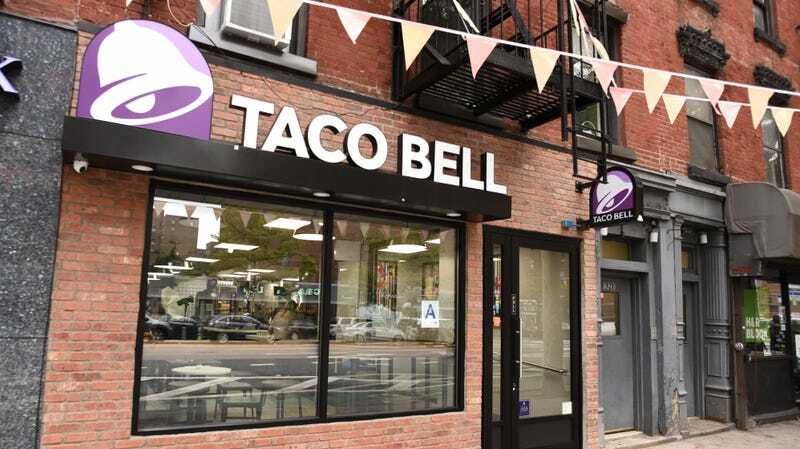 Taco Bell’s first-ever hiring parties were held in Indianapolis in July of this year, consisting of two days of events at four area Bells. In about six hours total, the company received 73 in-person job applications, 40 of which “were identified as perfect fits.” As the company notes, that means approximately half the people who applied during the parties left with a job offer all but assured. Additionally, promotion of the events on social media and on job sites led to more than 300 online applications. The events were so successful for the company that, per Moneyish, Taco Bell plans to roll the program out nationally in 2019. Besides the prospect of employment, job-seekers (or at least free food-seekers) were lured to the hiring parties by the prospect of, yes, free food. The company gave complimentary Watermelon Squeezes, Nacho Fries, and gift cards to attendees, and presumably coaxed them into playing trivia games as well. Shake Shack, it seems, is also wont to throw the odd hiring shindig. (Does the whole shack shimmy? Sorry. Moving on.) Natalie Diehm, Shake Shack’s director of talent acquisition, told Moneyish that the point of the events is to make it “easier and faster for candidates to get to know us, and get hired... They don’t need anything — they can just show up.” Shake Shack’s events, which receive a big social media push by the company and are usually conducted at a local restaurant or brewery, involve the unloading of free T-shirts, koozies, sunglasses, and (naturally) burgers; some recent parties in California have resulted in the hiring of around 40 percent of those who attended. It’s unsurprising that chains would be turning to some cool-mom hiring tactics. As reported last month, restaurants are facing a looming Generation Z (people born between 1997 and 2012) employee shortage, both due to changes in population as compared to job growth and to a reluctance to stick with the industry after such workers are first hired. A survey conducted by the National Restaurant Association Education Foundation and the Center For Generational Kinetics published last month revealed that 82 percent of employed Gen Z survey-takers said their first job was in a restaurant, but about three-quarters did not remain in the industry.